For Halloween I started to ponder destinations I considered haunted. Destinations when darkness descends on the streets, stories of spirits fill our imagination. Places you visit and leave with the belief ghosts are not just fantasy, but perhaps reality. In a city of much literary fame, from Dr Jekyll and Mr Hyde to the present day world of Harry Potter, even the writers seem to create a haunted and suspenseful fiction in Edinburgh. And walking the streets coupled with learning its past, you can truly understand why. The architecture and history, it seems a perfect setting for such stories. On my visit a few years back, one that coincided the city’s famous Fringe Festival, I left impressed. Not just by the acts and shows I watched in the theatre, but the city itself. A magical place. A place I look forward to returning one day. And a place with a certain haunted vibe. 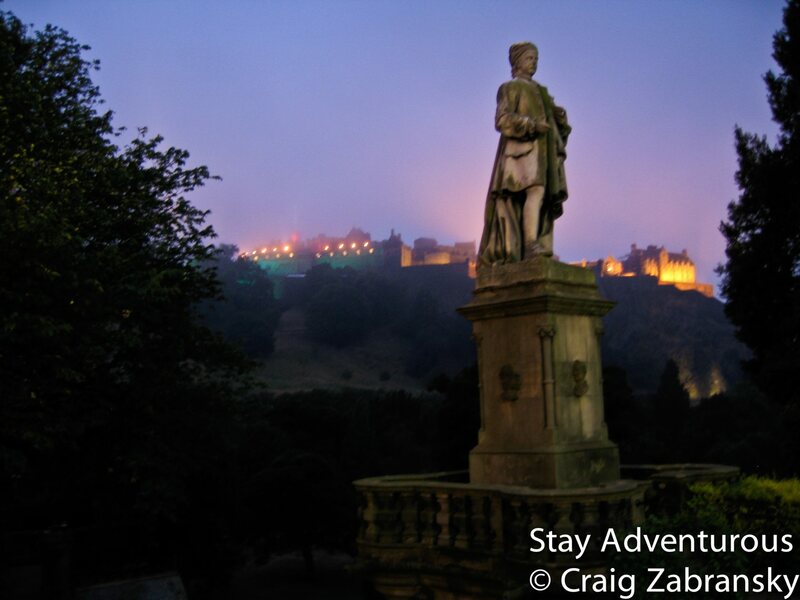 One night walking along a ridge over looking the main Edinburgh castle, I took this picture. With the sun already set, but the twilight still illuminating the sky, this picture itself seemed a perfect fit for today. Happy Halloween. darkness descends on Edinburgh castle and the city. And of course, Happy Sunset Sunday, too. The image was selected for the 2016 Sunset Calendar. I never expected to witness sunset magic in rainy Scotland. I chased sunsets in Glasgow and searched for sunsets elsewhere in the country, but there was something about this moment in Edinburgh, a bit haunting yes, yet totally magical and wonderful evening out and about. This IS a perfect picture for Halloween…on my screen, the sky is purple and magical. I was also quite enchanted when I visited Edinburgh last year, and your photo is an excellent capture of the magic that can be felt when visiting the city. Great post, Craig, and I love the photograph. Edinburgh is at the top of my list of places to visit. Thanks also for the not-so-usual Halloween celebration! That statue looks creepy, I wouldn’t want to hang around that area late at night..!